It's almost one year since I appeared on the Martha Stewart Show demonstrating one of my faux dessert techniques. Because that day, December 7, 2007, was such a jumping-off point for Jenni B Originals, I've decided to have my very first giveaway in celebration of the first anniversary of this event. 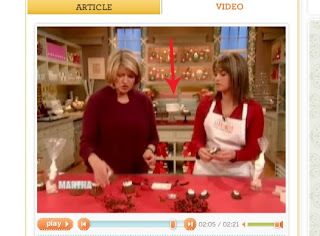 If you want to see my claim to fame on the Martha Stewart Show, just click on the picture of me and Martha to the right. 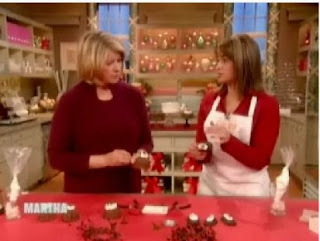 It will take you straight to the clip on http://www.marthastewart.com/! This is a shot of the set of the show before filming. Because this experience was so special to me, I want to give away something UNBELIEVABLE! Some have heard the story of how when I went to New York City to be on the show, the producers told me to bring as much product as possible to showcase. When Martha saw the set decorated with my things she was in love! During the commercial break between the segments I was on, she asked if I'd be willing to let her take all of the cakes (pictured behind us on the set) and some of the ornaments home with her to photograph for an upcoming book (of which I'm not sure is published yet). What do you think I said? "Yes! ", of course! So she had these things of mine in her possession for a few weeks until her personal assistant got them shipped back to me! Look where the arrow is pointing and you can see my faux cakes in the background! So why did I tell you this story? Because for this giveaway, I'm going to give THREE lucky winners one of the EXACT (not a copy!) ornaments Martha took home with her and touched with her own Queen of Crafting hands! Isn't this going to be fun? Now I have to say, these ornaments do not have a hanger of any type attached. They are just as the producers of the show left them. You can see they displayed the treats on a cookie sheet. This image is a screenshot taken from the show! The faux treats for this giveaway are circled in the photo above. I will draw the winners of these ornaments on the anniversary date of December 7 at 8:00 p.m. and the first name I draw will have first choice of ornaments. The second number will have second choice and the third number (of course) will have third choice. But they'll all be terrific prizes - certainly something you'll want to keep and tell all of your friends about! To enter, all you need to do is leave a comment to this post and make sure I have a way to get in contact with you if you win (I can get your email from your blog profile if it's there). But guess what? I'll even put your name in TWICE if you put a link back to this post on your blog - just make sure to let me know in your comment that you've done it. And if you want, you can share any good thought/feeling/experience about Martha Stewart! Go and spread the word about this fun Holiday Giveaway! You betcha I'll put a link on my blog, sweet chickee!! I've never seen her show since we don't have a television—just internet! But give me a few minute to put it on and I'll be so excited you won't believe it!! Wooooohoooo, almost as good as living celestially, honey! It's scheduled for tomorrow's blog, honey! Hope you get lots of people, but I hope I WIN!!!! Oh my goodness!! What an opportunity, to be on Martha Stewart!! Congratulations, you were awesome! Your faux treats are fabulous! They look so REAL! I love them. I want some :) Thank you so much for letting me know about this wonderful giveaway! Thanks for visiting my blog. I absolutely love faux desserts, and used to buy them to sell in my shop. I love the way they look with antique cake stands, plates, teacups! Congrats on the Martha show, must have been thrilling! I would of course love to win one of your creations! I think your blog is super cute! wow my bday is dec 8th. so is should for sure win. Great giveaway and here I am to participate! Love your work! oh, martha. when i was 19 my boyfriend, yes, boyfriend, got me her cookbook for my birthday. he's no longer my boyfriend but the cookbook is around...the binding is shot and the pages are splattered. congratulations on your success. thanks for such a fun giveaway. i'll post the link in my blog. enjoy the holiday season. They look SO yummie, I could eat them if they were real lol. cute!! i'd love to win these!! FABULOUS!!! What a great giveaway and congrats on your show apppearance. The faux treats are wonderful. oooooooooh, pick ME Jenni B!!! i would love one of your gorgeous treats!!! Oh my gosh.... your blog is so cute! And those faux treats are delish! I'd love to win one of your fun creations! Congrats on celebrating such a wonderful milestone. How sweet of you to give away some of these special ornaments! Please throw my name in the hat for the giveawy! I saw you on Martha last year and it was a great segmant. I love her and don't miss her show. Congrats to you on the milestone! Please enter me in your drawing. I have faux pasteries all over my house. I've always loved and decorate with them! I just made a cute faux hot chocolate and will be posting a pic of it on my blog tomorrow. I will put a link for you on my post tomorrow! what a great give away! I loved you on Martha's show, and all your wonderful faux treats. Hope you have a great fun with your giveaway, and meet lots of new blogging friends. Congratulations on being featured on Martha's show...what a dream come true! I think I would be way too nervous to do such a thing..you're very courageous. ooooo let it be me let it be me let it be me!!!! 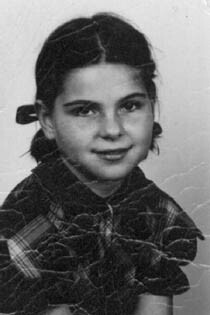 I will feature you on my blog tomorrow :-) and I'll leave another comment when I have with the link! Thank you so much for visiting my blog and for your kind comment! I would love to enter your drawing - what a great giveaway!! Congratulations on being on Martha's show. What an honor! Congrats on being on Martha! 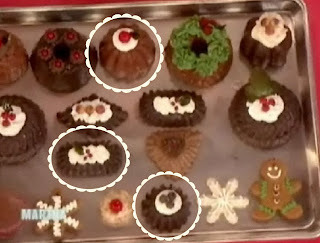 That is so wonderful for you, I watched the clip and I would love to make some of those ornaments, do you know where I could buy some of those molds? Preferably for cheap? Please enter me in the giveaway, I would love to win one of those yummy creations!! I have linked you on my blog and wrote a LONG blurb about your giveaway and your yumminess! I am keeping my fingers, legs, eyes, my everything crossed!! Oh I am for sure posting this at my blog! Thank you for the wonderful giveaway! Those look incredible!!!!! Thanks for letting me know about your giveaway!! I actually watched that show and I loved your faux desserts so much I made a cake after I watched the show! I have had several people comment on it asking if it is real, although mine did not turn out as good as yours did (; I had fun making it! Put my name in the hat for the drawing, I've got my fingers crossed! Okay Jenni I put a link back to your blog~so you can put my name in twice (; Thanks! Thanks for the super fun giveaway! Woo Wee, I'm so in! I actually just posted a little something on my blog about Martha and I being on first name basis now ;-) How very sweet that you got to go show off your stuff on...you go girl! I hope I win these amazing treats. Everything you make is absolutely deliciously, beautiful. I am so happy for you that business is booming and wish you the very Happiest of Holidays this year. I'd feel a little guilty winning this . . . but only a little!!! Love you! Awesome Jenni! Thanks for making me aware of your sweet giveaway!! I will link back as well once I get a little more time later today. One of my dogs was neutered today and I'm off to pick up the poor guy. I have been a Martha fan for many years and have taken a lot of ribbing about it over the years. All in fun. I would love to win one of your little ornaments especially after Martha has had it even nicer. I watched the video and am going to get out the blender and give them a try. Have always loved cake decorating. I just started my own blog last weekend and don't know how to add anyone yet. Lucky if I can post and get a picture up there. When I can I will add you. 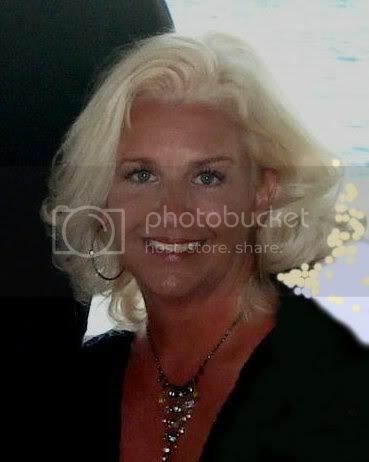 Hi Jenni ~ What a thrill that must have been for you...so exciting. I will absolutely post about your giveaway on my blog...I'll have it up tomorrow. 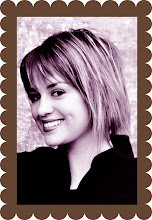 Found your blog through pampering beki....awesome talent you have! So generous of you to part with these...I'd love to add one to my tree. Thanks! I tried to leave you a comment last week but it would not let me for some reason...haha check your sitemeter to see how many times Salt lake City refreshed the page! What a doll you are to say hello and tell me about your giveaway. I would love to enter. I never win anything and I know another blogger who happens to win them ALL! Some people have all the luck! I hope you had a marvelous Thanksgiving and an exciting start to this magical holiday season! Thank you for the beautiful inspirations you bring us all! You are so very talented and I am thrilled we are blog friends! Hope to meet you in person one day! Being on the Martha show is such a remarkable accomplishment! Please put me in the running to win one of your lovely cakes! I will post about your giveaway on my blog, today!! Yummy!! Sign me up!! Maybe I can clone another Martha with her fingerprints....oh, but wouldn't my home be lovely then..... I am a big fan of hers in many ways. Thank you for the invite..I cannot keep my cupcake out of my sight..I even put it in my purse! Congrats on M.S.....I was just thumbing through this months Xmas issue! I love your work!! It was so fun to see you live on Good Things Utah with Natalie! I'm so happy that you are so successful and enjoying it so much! I'm not a blogger so my email is peblstone2001@yahoo.com Love Ya! OOO what a great giveaway! I came over from a blog that I read everyday and she had liked...What a great giveaway! Congratulations Jenny! Your non-edible delights are wonderful. How fun to be a guest of Martha's show. Thank you for visiting my blog and leaving such a "sweet" comment. I LOVE ornaments. Count me in. I would love to win one of your faux pasteries. They are all so beautiful. Sorry, I don't have a blog, but I enjoy reading yours. Count me in please!Thanks and have a great week. And might I say, they look quite tasty! wow, great giveaway! i love martha, you are so lucky to have appeared on her show! how awesome! please count me in, thanks! Cool.......I love your faux food and it's non-fattening too! Do I get entered twice now????!! Enter me please! Martha is such an inspiration and what a wonderful experience for you to be on the show! AND, in a future book! :) How cool! I will list the giveaway on my blog too! Thanks for doing the giveaway! I remember seeing your segment on Martha...How exciting that must have been! Love all of your sweet faux treats. Jenni! thanks so much for stopping over and leading me to this fabulous giveaway! I have long loved your faux dessert creations! I think it is just amazing that you were with Martha- such an accomplishment to be proud of! Please enter me and I will post about this giveaway right now on my blog! Congrats and thank you! So much fun. Count me on this wonderful give away! Happy day and how wonderful she was thrilled with your products! I would love to be entered in your drawing. Your stuff is adorable! Congrats on being on Martha! I wish I had a blog so I could be entered twice!! Kandeland sent me over and I am so impressed! 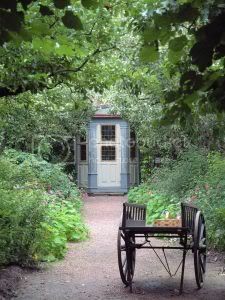 I work so I seldom find time to see Martha but am thrilled to find you and your blog! I can't wait to read your archives! Yummy!! And I am debe14@msn.com since I am sure to win! Congrats on your being on Martha. Hi Jeni, I'm, Holly! Thanks for hosting this give away! I would love to win! Wow, 73 comments. You have a lot of fans! Thanks for stopping by my blog. How lucky that I came to visit yours today! What a wonderful giveaway. I've met that Martha three times and even had breakfast with her at a friends home. So I know how exciting it can be! Your petite cakes and confections are just adorable! Happy Holidays! When I saw these on Pampering Beki, I was totally fooled! Oooh those are gorgeous, I absolutely love them! Even if I don't win, I may have to indulge. Beautiful desserts without the calories! Posted about it on my blog too! Gorgeous faux treats! They look more yummy than real ones! I'd love to be entered, and I am posting a link on my blog right now! I'm in too! Thanks for doing this giveaway!! have a wonderful week !! hope you had a wonderful thanksgiving ! Yummy! Blessed by the queen herself...does it get any better than that! It must have been thrilling for you! Hi Jenni, I'm reading your blog as always, awesome giveaway ! And do you believe it ? I see on the photo some of the cakes I talked you about, particularly the gorgeous chocolate bundt with buttercream and sugared berries ! I will send you the photos again. Meanwhile I'm so happy I met you in etsy and I'm waiting for all my cakes, thank you so much Jenni ! Big hugs from France ! Wowee what a super fun and generous giveaway! I will be linking it up on my next post! I must join the fun .. Please add my name for this wonderful gift.. I would love to be entered in your drawing - what an exciting experience for you and your business! Good for you and your success! Your products look so yummy. Hi I cannot find the video? I posted your link on my blog with one of my cupcake paintings..zero calories! Thanks for the invite to join your giveaway! How cool is this?!? Something touched by the original "Martha"!!! Love your little "desserts". They are so realistic. Still want to buy some help promote the teas where I work. Martha - a different one! what a great giveaway! you met martha??? awesome!!!! :) lucky girl! Your stuff is amazing! I would love to be in the drawing!! Cool! Enter me please! These would be so great to own, and such a great conversation starter!! Omg I'm the 100th comment! Thanks for letting me know about this awesome giveaway Jenni!! How Perfectly SWEEEEEEET of you! No! Pick me! Pick me! I found you through Martha's blog, not that Martha, MJ ornaments. Your faux treats look good enough to eat. Hope you can visit my blog sometime. WOW everyone want in this give-a-way!! What a wonderful experience. TREAT in there! pun intended! I am Kel-e P. and live outside of Atlanta. Love your fun fun things!! Yummie stuff! Congratulations too. Please add me to the giveaway list...and I will put the link back here on my blog! I watched the video in awe! What a really neat thing for you to do. Thank you! What an accomplishment to say that you have been on the Martha Stewart Show!!! I would love one of your too-good-to-eat treats! I especially love the caramel apples and cupcakes. So creative and realistic!!! You do amazing work! Oooohhh, what a yummy little giveaway, Jenni! Thanks for the heads up...hope I'm one of the lucky 3!! Wow, you've gotten a huge response so far! Sure hope my luck comes through:). I am so glad that you visited my blog and I was able to check out yours. What a great give away. I love all your faux treats...so pretty. A spot on Martha Stewart's show, how thrilling! I met her once at a book signing when she autographed a gardening and a cookbook for me. Your faux treats look so real. I enjoy reading your blog. Please enter me in your give away. I just found your blog from a link and think it's wonderful. Love your style. And how wonderful that you appeared with Martha, your treats are adorable. Please enter me in the giveaway, too! What an awesome experience!! Love your creations!!! Happy Holidays and please enter me! Please add me to your fab giveaway. I will add your link tonight to my blog. This lovely entry is for Jackie Markley. How AMAZING that you were on Martha's show! Please enter me in your FABULOUS give-away!!!!!!!! Jenni, I would love to be entered in your give away! That Martha show was wonderful, good job. Faux desserts -- just the thing to round out my holiday menu without rounding out me. Congrats on your MS anniversary! I too saw you on Martha Stewart's show. What a blast that must have been. Your etsy store has lots of fun faux cakes and cupcakes and the gingerbread men are too fun!!! Yes, please enter me in your great give away. What a great giveaway Jenni! What a wonderful blog you have...and you are so talented...I've always loved faux desserts...please enter me in your giveaway. I can be emailed at christielynn33@yahoo.com. Thanks so much! Oh how fun! I just found your blog via a friend's blog and have to tell you congrats for being on Martha Stewart's show! How exciting is THAT!!?? Please enter me in your drawing. I'd be overjoyed to win!! How exciting for you! And so nice of you to pass some of your fame on to us! Sign me up! 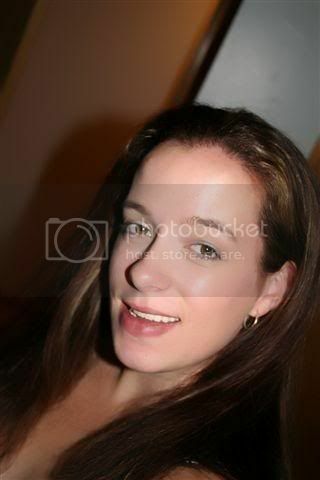 Hi Jenni B. I Just love all of your great sweets besides that I'm giving my kitchen a makeover in pink and tans they sure would look great in there so pick me pick me!!!!!!! HI, Jenni! It's so exciting that you're business got such a boost from Martha Stewart. It'll be so fun for you to see your pictures in her book. I'd love to enter the contest. Gayle Weyman, Ventura, CA weymanns@pacbell.net. Happy Holidays! Ooh! I hope I win! Great giveaway!! Please count me in!! Your faux treats are amazing! Very cool, love your work! How fabulous is this!! We love it!! Aww....those ornaments are adorable! I've always loved faux food. Yours look good enough to eat....though I guess I better not! Please enter me in your giveaway....I promise not to eat what I win(though if I did, perhaps that would be a....compliment, a.....good thing as Martha always says. What a wonderful and fun experience it must have been for you! Congratulations! Your faux desserts are as sweet as they can be. How interesting and exciting! Please enter me in your giveaway! Thank you for commenting on my blog. I know I certainly enjoy reading your blog. Hope you have a lovely new week. Those are so cute - and congrats for making it on the Martha show!!! I will add you to my blogroll and try to figure out a link!!!! Congrats on being on Martha's show...How exciting!! Very good and quite yummy looking work!! How fun, I'd love to win! You want to hear about me and Martha? i bought every single magazine starting with the Premire issue (luckily we live in a big house). I used to get up on Saturday morning and record her TV shows on videos! (Yes, still here.) And now I follow her from channel to channel. I've always been inspired by Martha! How amazing it must have been to be on her show! Hugs, and wish me luck, too!